It does not matter whether you are operating a small or a gigantic business. Data still holds much importance to organizations. It is thanks to data that the business is still operational in the first place. What that means is that the security of data in your organization should be given priority. Information is valuable. Failure to protect data for your business has major implications. Your business is less likely to survive of the data cannot be kept intact. Data breach or loss could lead to significant losses and weigh down on the credibility of a business. If you are operating a small business, the following are data backup strategies that you should employ to keep your data safe. The fuss about cloud computing is well worth it. Cloud backup and data storage has been found to be the most efficient compared to the traditional storage methods. With tools such as Ottomatik MySQL backup, everything has been simplified and made convenient. Such software allows the automation of backup to the cloud eliminating errors that could lead to leaving out of important files during storage. Cloud storage will also be a cost-efficient data backup method for your small business. You will not be required to purchase any expensive hardware for storage and an entire IT team to take care of your data. Cost-efficiency is not the only benefit that comes with this kind of storage. You can be able to access your data from anywhere provided you have an internet connection. DAS devices are connected directly to the computers. Examples of DAS devices include external hard drives and pen drives to mention a few. The significant advantage of using DAS is the fact that it allows you to backup large amounts of data within the shortest time possible. It is also easy to use as all you are required to do is attach the device to the USB port of your computer and transfer the files. Also, this kind of storage is relatively cheap. However, you should note that it can be a little tedious if you are backing up data from different computers as you will have to move to each work station to collect the data for storage. As a business, you should not rely on only one form of data protection or storage. What that means is that as much as you may have cloud storage, you should also have copies of the data in digital storage systems. This data is still faced by some threats, and you need to go an extra mile to ensure that the said data is protected. Your hardware could be destroyed by fires, floods or any other natural calamities. Investing in disaster-protecting storage involves providing safety to your data by using waterproof and fireproof safes or devices. Disaster protected storage may also be in the form of Network-Attached Storage. A NAS device is an appliance that is connected directly to a network. NAS is better than a DAS in the sense that it allows access to the data provided that the computer is connected to the particular network. It is vital to implement this data backup strategy as it saves on cost through the centralized storage. 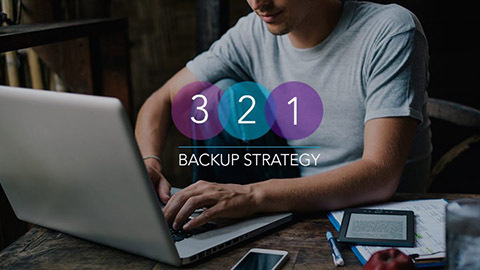 The other modern data back-up strategy that you should apply to your business is the 3-2-1 strategy. What that means is that you should have three copies of your data. The two copies of data should be stored onsite but in different mediums. The remaining copy should then be stored offsite. This data backup strategy ensures that the continuity of the business is maintained even if something happens to the backed up data. Note that if one of the copies stored onsite gets destroyed, you will still have to extra. As a business owner, you should do everything possible to keep the data in your organization safe. You should also consider using more than one data backup strategy to eliminate the single point of failure. As you pick the best data backup strategy, you also need to consider its scalability as your data will keep increasing with each passing day.